The pontoon boat, for those who aren’t aware, is different than a speed boat. If you are new to boating, then you probably aren’t too aware of the different types of boats out there that you can take out onto the water. Take the time to educate yourself with our blogs about the big picture of boating. To learn more about the beginning elements of boating, read Tips For First Time Boaters – Part One, Part Two, Boating Safety Tips For Spring – Part One, Part Two, and What To Bring Boating With You. In addition, If you’re interested in checking out a boating club that can meet all of your needs no matter how experienced of a boater you are, then come visit us at Freedom Boat Club. Freedom Boat Club is located right on Lake Lanier in Buford, GA, and is able to offer you something no other boating club can in the area: the access to any type of boat you want to take out onto Lake Lanier. If you want to take out a speed boat, you can. If you want more of a torpid day, then you are able to with our boating club. As a boating club, we allow you to choose from any of our boats to take out onto Lake Lanier. Unlike some boating clubs, we are a great alternative option to owning a boat. Instead of having to worry about bringing your boat to us, you’re able to pick from our selection of boats. If you’re interested in coming to Freedom Boat Club to explore the many boating options we offer, then take the time to learn more about our boating options or call (404) 901-4907 for any questions. 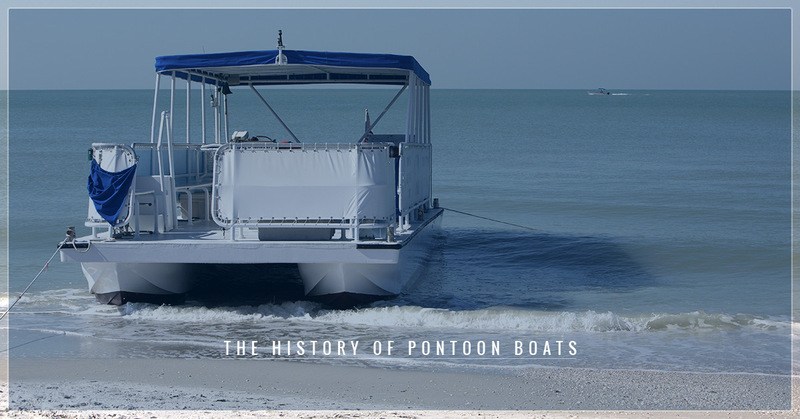 In today’s blog, we’ll be going over the history of pontoon boats. In a previous blog, The History Of Speed Boats, we went over how speed boats came to be such a popular type of boat. In comparison, today we’ll be going over how pontoon boats came to be around. Pontoon boats, unlike speed boats, are slower and can hold heavier loads. Unlike a speed boat, a pontoon boat is a type of boat that has a buoyancy and flotation to keep it more afloat. It is a level boat with pontoons underneath it to help it float. A pontoon boat is great for fishing, relaxing, and having more people indulge in the fun. It’s more of a raft than a speed boat and if you’re looking for a speedy experience, it’s best that you stick with a speed boat instead of the slower pontoon boat. Pontoon boats are also great for families and at Freedom Boat Club you can even bring your four-legged friend. So, how did the pontoon boat come to be? Let’s find out below! If you’ve always thought that pontoon boats were a great option to have fun with the whole family, then you wouldn’t be wrong. Pontoon boats were invented to have fun with the whole family. Unlike speed boats, pontoon boats haven’t been around for as long of a time. Speed boats were invented at the turn of the century, unlike pontoon boats that have only been around for the last sixty or so years. The entire concept of the pontoon boat originated when a Minnesota farmer wanted to create a family-oriented boating vessel so everyone could enjoy their time out on the water. If you’ve ever gone out with a big group of people for boating, then you’ll understand how important it is to have a floating device that can fit everyone you want to spend time with. A farmer from a small town in Minnesota decided that he wanted to create a boating vessel that was more oriented for families and began to modernize the concept of the boat that’s been around for centuries. Instead of having a larger ship or a speed boat that’s concept was still being honed, the farmer decided to make a boating vessel that was much easier for families to enjoy. The farmer began to look at the history of boats to figure out what materials would be best to create a platform. The farmer decided to begin tying logs together for a platform, which is the modern day version of a pontoon boat. He was not the first one with this idea, however, he is still credited with thinking up the first modern pontoon boat. His model was the prototype for the Weeres Pontoons, the first pontoon company in the entire world. The prototype consisted of a solid wooden platform with two steel barrels strapped to it. Even though the pontoon boat was created, it didn’t mean that people were ready to go out onto the water with the pontoon boat. The farmer needed to make the pontoon boat more stable if anyone was going to go out onto the water. The farmer began to work with different materials to figure out how the pontoon boat would become more steady. While he experimented, the farmer created a pontoon boat made from steel oil drums that were combined together with a upswept nosecone feature on the pontoon boat. In addition, there was a plywood deck and a railing to keep people from falling over. Lastly, the farmer made a steering wheel, which was basically a stick that moved forward and was connected to the engine. The stick could only move left, center, and right, but it got the right point across. Thus, the first pontoon boat was created and able to sustain people safely onboard. The concept of pontoon boats has actually been around for hundreds of years. During ancient times, people began to use floating circular logs and other materials such as inflated animal skin to create a platform, which was the earliest version of a pontoon boat. The concept of the pontoon boat was originally created to support military bridges so that armies were able to cross areas of water. The farmer decided to make a pontoon boat because he lived in Minnesota, which is known for its many lakes. The farmer wanted to make a marketable idea and thus came up with the pontoon boat. In addition, the first pontoon boat was called ‘The Empress.’ The farmer began to create and sell various pontoon boats. He became so famous he was elected to go into the Minnesota Marina Hall Of Fame. If a pontoon boat sounds like your type of boat to take out onto Lake Lanier, then make sure you check out all of our pontoon boat options.